Ilya Raskin is seeking cures and treatments for ailments afflicting hundreds of millions of people. And he's trying to find them – along with anti-aging and other beneficial compounds – in myriad plants in 20 countries on four continents. Raskin's laboratory at the School of Environmental and Biological Sciences studies the health benefits of crops and medicinal plants. A major focus is on revealing the molecular effects of chemical compounds in plants, vegetables and fruits on chronic diseases, including inflammatory and autoimmune diseases and gut problems. The lab, headquarters of the Global Institute for BioExploration, is also developing botanical therapeutics that promote health, wellness and beauty. The lab's research led to the creation of Nutrasorb LLC, a company that develops and markets enhanced botanical ingredients and crops. Moringa oleifera, or moringa for short, is a small, fast-growing, tropical tree with edible leaves that have been used to fight diabetes for centuries and other edible parts used as nutritious food and in traditional medicine. Rutgers Today asked Raskin about his pioneering research on moringa, also known as the horseradish tree. Rutgers Today: What is Moringa oleifera seed extract and where does it come from? The extract comes from a tropical plant that is called moringa, which we have studied for at least four years in the lab. It's an edible plant that has an incredibly high content of many nutrients, vitamins and micronutrients, but it's also very high in protein. On top of that, it has some bioactive components that are beneficial to human health, and this is really where our interest is. Morigina is used as food throughout the world, particularly in tropical regions, and is nutritionally related to broccoli. Rutgers Today: Where is moringa found? The plant originates in Southeast Asia, but it's widely grown now in Africa. Some of it is grown in South America, and it's also grown in Cuba, so now it's all over the world just because of its nutritional properties and health and wellness benefits. But there isn't much of it in the United States since Florida is a bit too cold. The only state where it can grow with success is Hawaii, which is really the only tropical state we have. Rutgers Today: What are the known or potential benefits of ingesting moringa or putting it on your skin? Moringa may provide strong health benefits when it is eaten and we are actively working to develop moringa applications for functional foods, beverages and dietary supplements. When it comes to skin, moringa compounds have powerful anti-aging and inflammatory effects, and they work to protect skin cells from environmental stresses, such as UV radiation. Moringa is particularly useful for skin because our skin cells are always under assault from the environment. The compounds in moringa mobilize natural cell resources to fight those stresses. Rutgers Today: Do you have plans to share your moringa research with the beauty industry? We are excited to partner with Estée Lauder this year. They were particularly interested in our moringa as we have managed to maintain the activity of a special molecule within the extract to help deliver exceptional benefits to skin. I'm glad Rutgers and Estée Lauder are coming together because our work on this ingredient will lead to skincare products that will benefit consumers. 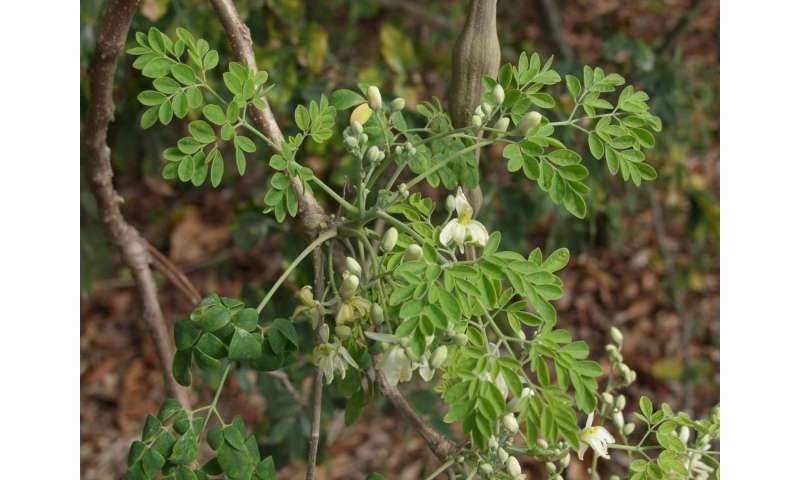 Rutgers Today: What are the next steps for moringa? The next step is to develop an oral or dietary supplement, or possibly a food product, that will help fight diseases like diabetes and arthritis. When taken orally, we believe that moringa's powerful anti-inflammatory effect on our systems can prevent or help to cure some of the chronic diseases based on inflammation. Not fully safe to ingest moringa leaves!